My oldest friend (that is, the friend I’ve had the longest) just welcomed her second child at the end of March. 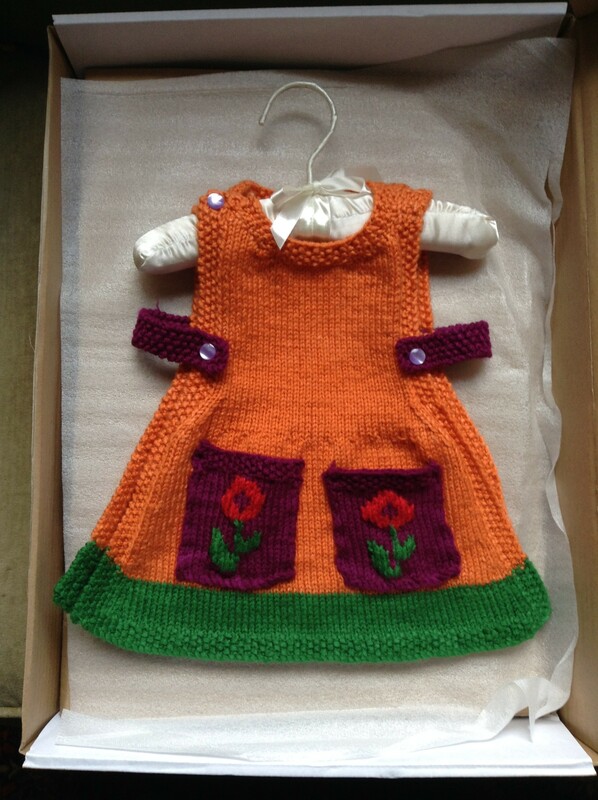 I started knitting for this baby late last summer. First I decided to knit a blanket. I made up this log-cabin design as I went along, and managed to knit this entirely from stash. All of the yarn is pima/tencel DK weight; about half of it is left over from Sylvia’s Anouk pinafore (for which I was very cautious and aggressively over-ordered yarn), and the rest is left over from other projects. 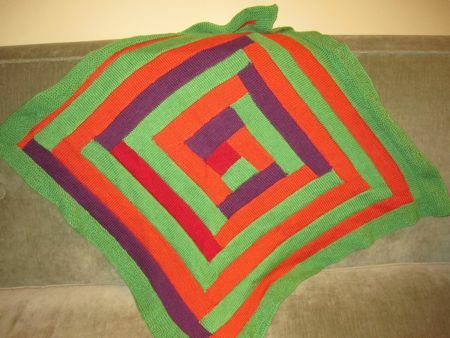 I actually finished the blanket over Thanksgiving weekend and thought I was done. 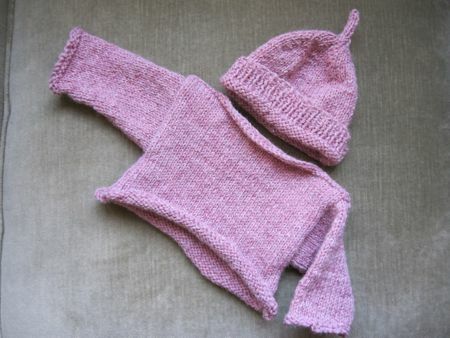 But about a month ago I came across some Wool-Ease in my stash, in a nice muted mauve/pink color, and decided the baby (which we now all knew would be a girl) needed a sweater, too. This is the Simple Boatneck by Debbie Bliss, my favorite go-to sweater for babies and toddles. 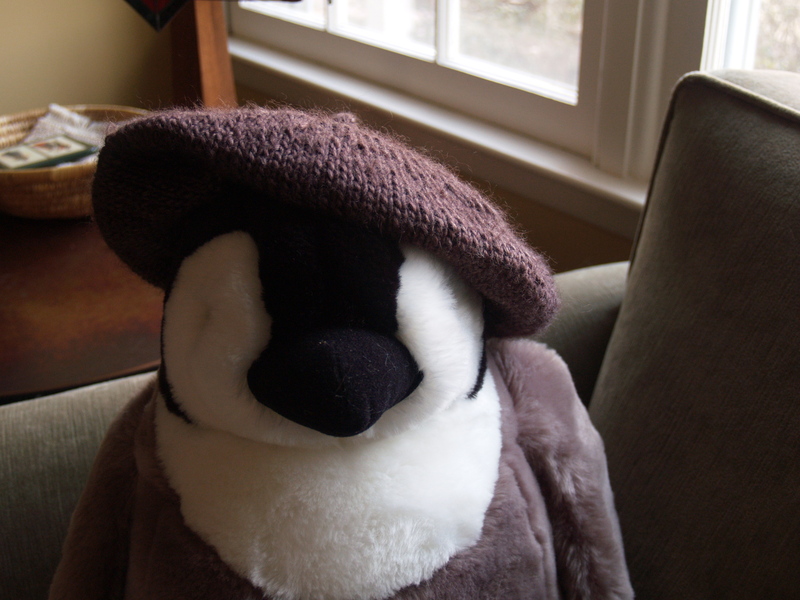 And of course once the sweater was done I needed to make a hat to go with it, right? Two friends of mine just had their first babies. One friend is someone I was close to in high school, saw a lot in early grad school (he lived in the same town where I was in school), and fell out of touch with for several years. We’ve recently resumed contact, and when I learned that he and his wife were expecting their first baby this month, I knew I just had to knit a hat for them. 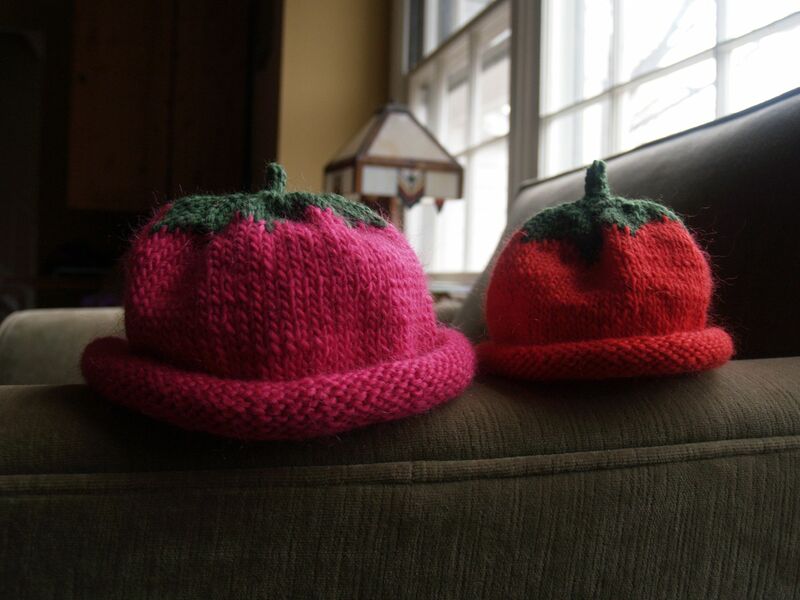 Their daughter arrived last week, and I knit the little red strawberry cap for her in one three-hour stretch; it will go out in the mail this week. The other friend is someone I met in Oregon many years ago. A little over a year ago I made hats for her and her husband as wedding gifts (and apparently they still get a lot of wear—hooray!). Their first child, a little girl, was born just over a week ago. Not long before that, I sent them a sweater and hat for the baby: a simple boatneck and rolled-brim hat, both from Debbie Bliss and both done in Rowan All-Seasons Cotton left over from Sylvia’s first Wallaby—and both, unfortunately, unphotographed before I packed them up. As soon as I’d heard that little Orla had arrived, I just had to knit her another hat. The pink raspberry hat is for her, and I knit it in a not-newborn size, so she’ll have something to grow into. I told you I was in a dishcloth-knitting mood these days. Saturday evening, while hanging out and chatting with some friends, I cranked out this Mason-Dixon Dishcloth (from Mason-Dixon Knitting, natch). This was the first time I’d tried this pattern–which is knit in the round from the outside in–and I found it to be a lot of fun. As long as I had a row counter, I was able to keep track of my knitting and participate in the conversation pretty easily without getting lost in either. For some reason, the bobbles at the points ended up on the wrong side of the fabric. 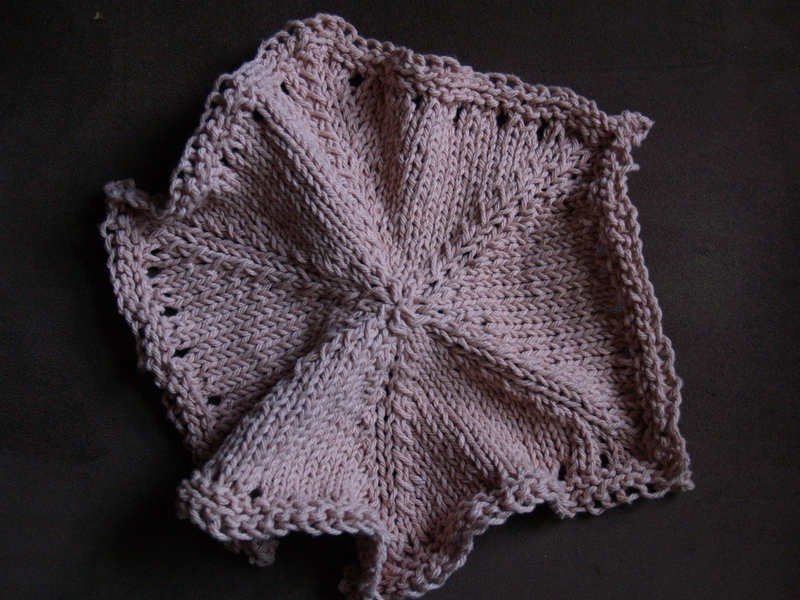 I’m not sure how that happened–I followed the pattern carefully, and the errata don’t say anything about the bobbles. 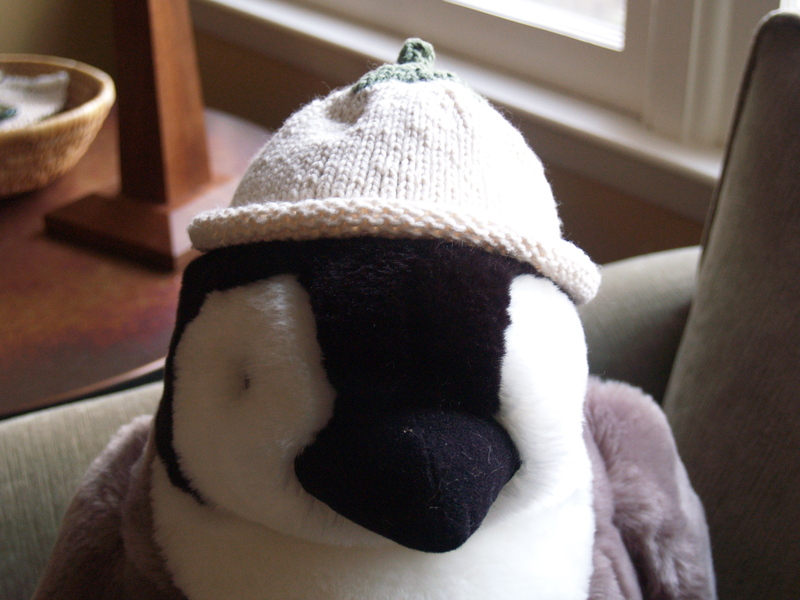 This was the first time I’d ever knit bobbles, too, so experience isn’t there to help me figure it out. Between Sunday and Monday I cranked out this one-of-a-kind number. 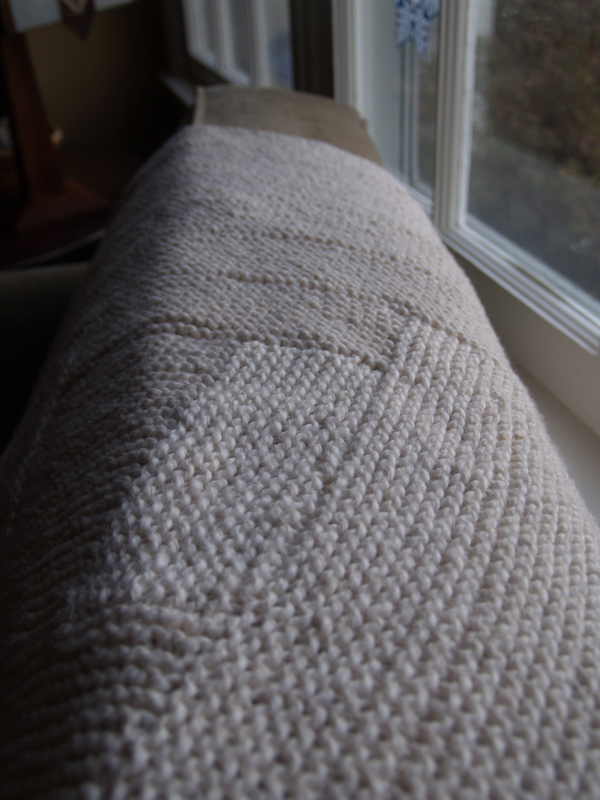 It’s based on the “Waterfall” stitch pattern in 365 Knitting Stitches a Year . My friend Katie has been using the stitches in this book as inspiration for her own dishcloth-knitting lately, and she lent me her copy for inspiration. 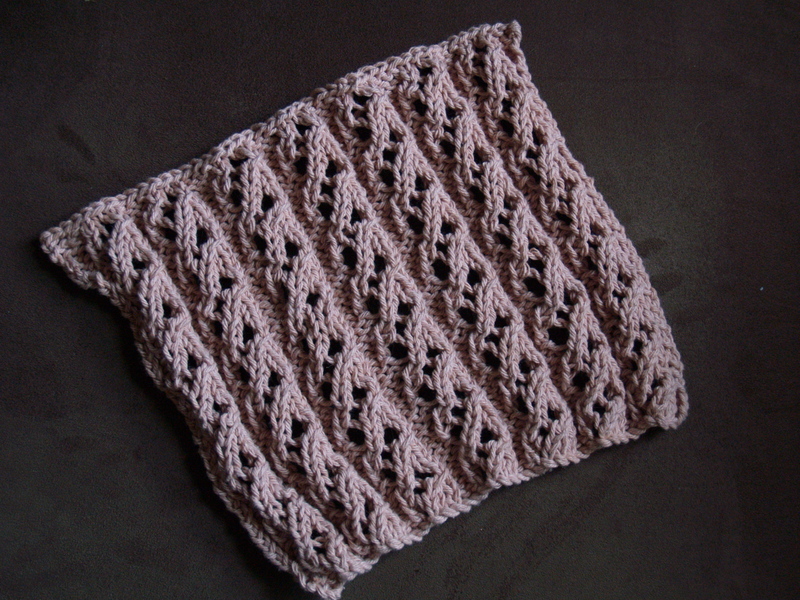 I really want to like this stitch pattern, but I don’t think it’s idea for a washcloth–the result is too loose. Inspired by my friend Gina, who recently completed an Unbearable Cute Baby Kimono (Mason-Dixon, y’all) for her niece who’s due in mid-August, I decided to whip up one of these myself. Since I had one ball of blue yarn and one ball of green yarn on hand–and I felt like playing with color a bit here–I strayed from the monochromatic scheme of the original pattern and used one color on the front and one on the back. I like the result, though I was surprised at how slowly this thing worked up. It’s knit in garter stitch in one piece, so I thought it would go a lot faster. What’s that hanging in the greenery? Those are three of the four baby sweaters I made for three friends having babies this summer. Interestingly, I purchased the yarn and chose the projects long before any of the babies’ sexes were know. As it turned out, all three babies are boys. How about that. 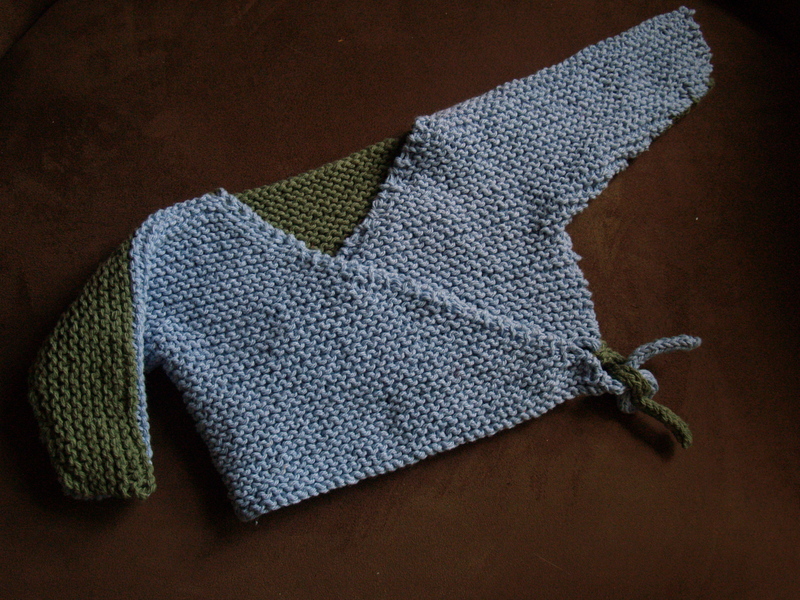 The simple boatneck was finished first and went to Liza (whose baby was born in late May) a couple of weeks ago. I finally completed the other three sweaters last week. Two were given yesterday, and one is already wrapped up and will be delivered soon. So I’m afraid this less-than-perfect photo will have to suffice until I can get photos of the babies wearing their new duds (maybe next winter?). The vest goes to Megan (whose baby was born last week). 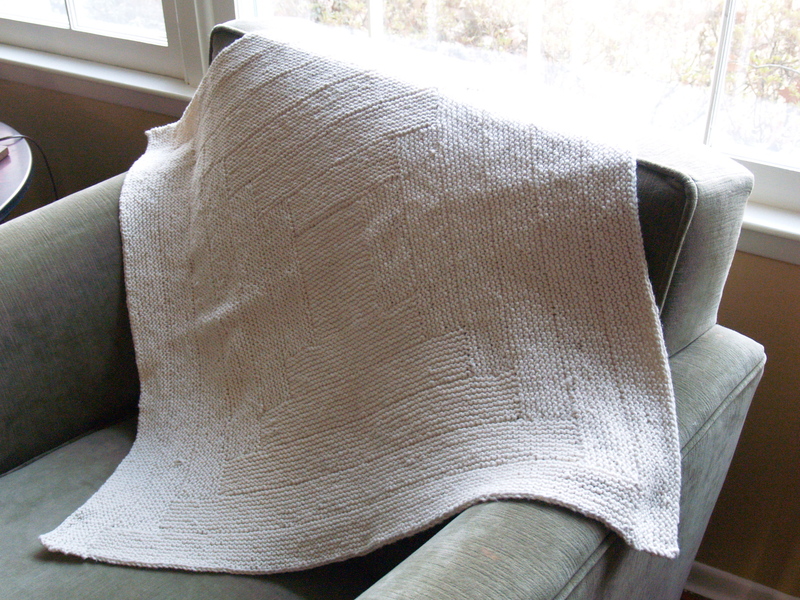 Sylvia modeled it before I wrapped it, but I thought I’d post a photo of it all by itself. I hope to see the baby soon, and I really hope he and his parents like this little item. The rows of purl stitch really pop against the stockinette background, but the pattern isn’t so complicated that I have to consult a chart for each row. The other two sweaters are for my friend Minjoo (whose baby is due in mid-August; she’ll get them today at her baby shower). The terra-cotta-colored sweater is in KnitPicks Shine Worsted (like the sweaters I made for my other two friends), which has a very nice hand and yields a surprisingly substantial fabric. This is a pattern I developed myself (and will try to write up soon), with some inspiration from Debbie Bliss’s Simple Boatneck and the famous Wonderful Wallaby. I did have one big snafu while making it: because of its very small circumference, I had to knit the body on double-pointed needles (rather than circulars), and because everything was all sort of scrunched up on the needles, it was only when I go to the point where the neck placket opens up that I was able to stretch out the knitting on the needles a bit…and discovered that I’d been knitting the placket in the middle of the right sleeve. Sigh. That was easily (though time-consumingly) fixed, though, and I am very pleased with how it turned out! Here’s a close-up of the neck and closure on the other sweater. This is the kimino sweater from Jil Eaton’s Minnies book. I chose Green Mountain Spinnery Cotton Comfort in Weathered Green for this one. I love the color. 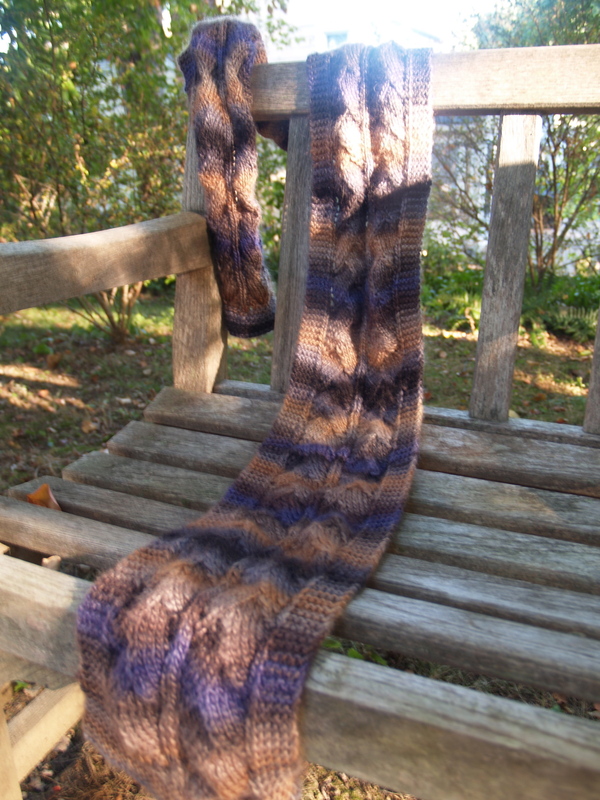 And I love the yarn–it is such a pleasure to work with. And I love that this yarn is from Vermont, where Jan and I got married with Minjoo as the maid of honor. No, I’m not referring to the Simpsons parody. I finished the vest I started a few months ago! Actually, I had it almost complete not long after I cast on. But pre-seaming, it looked too halter-top-ish. A few days ago, I decided to continue to follow the pattern as written (rather than try to modify it to get larger straps), and I’m glad I did: after picking up stitches around the neckhole and armholes and knitting a few garter rows, a vest emerged! The buttons on the left shoulder are a nice touch; the outer left shoulder, above the armhole, is sewn shut, so undoing the buttons just makes the neck opening larger and doesn’t open up the whole left half of the sweater. This sweater is a gift for a baby who’s about to be born any down now (he was due two days ago!). It’s a snug fit on my two-year-old Sylvia, modeling it here, so I’m guessing the new baby might be able to wear it this winter, and definitely the next one.